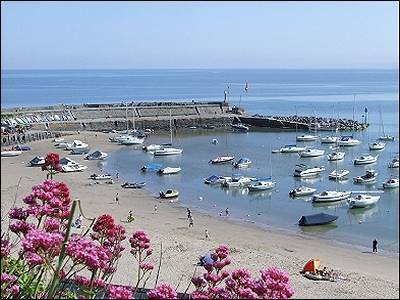 Arwel, New Quay - sleeps 5. ‘Arwel’ offers a cosy three bedroom cottage, located within a short walking distance to the harbour, sandy beaches, local shops and restaurants in New Quay, whilst overlooking the village and Cardigan Bay. The close proximity to the beaches and the village are mirrored by the opportunity for coastal walks no more than five minutes from the front door. Although ideal in the summer months, there is heating and two fires in the property making it ideal all year round. ACCOMMODATION - The house has two large bedrooms and one small. The two large comprise of one double which offers dual aspect with views up the garden and over the bay. The twin room offers ample storage, airing cupboard and vanity unit. The third bedroom is a single room also offering ample storage. All three rooms have front facing sea views. There is a good sized family bathroom overlooking the garden with bath, shower, WC and airing cupboard. Downstairs there is a small galley kitchen at the rear of the cottage and a dining room and sitting room at the front. The kitchen has an electric cooker, microwave, kettle, toaster and fridge. The dining room has an open fire and the sitting room has a multi-fuel woodstove, TV and DVD player, sofas and chairs. There are also storage and fan heaters if required. To the rear of the cottage there is a large terraced garden, tables and chairs with a panoramic view from the higher terraces. Steep steps are the only access and children must be supervised. Please Note : The house is regularly used by the owners who ask that their personal belongings be respected. Bed linen is included but not towels.. Parking is available at the front of the property. Marine Terr. Is an access only no through road, but has a turning circle at the end. Logs and coal are not provided but can be purchased from the local shops. Arrivals are at 3pm and departures at 10am.